Happy birds produce best. 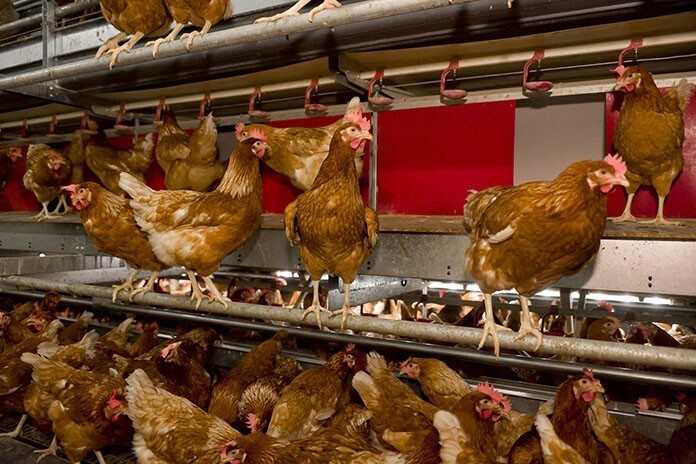 Aviary systems were invented to provide laying hens with maximum freedom, while using floor space efficiently. Aviaries consist of multiple tiers where birds are challenged to use the vertical space to find feed, water, nests and perches. 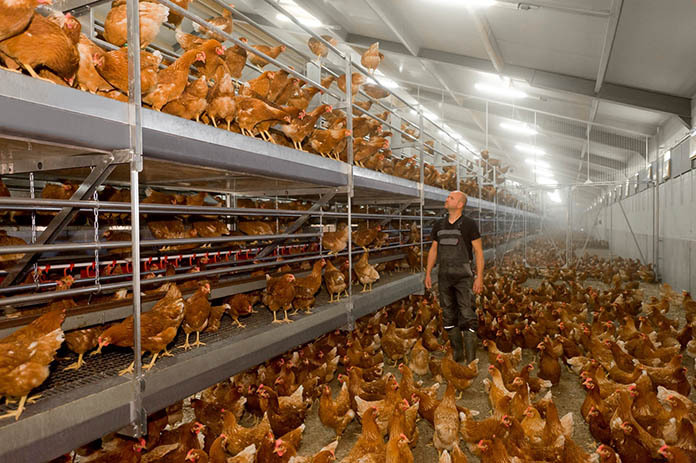 For maximum floor and nest utilization a house often has multiple system rows, and movement from one row to the other is possible. The challenge in designing an aviary system is finding the right balance between maximizing bird capacity, access to nests, water, and feed, and bird safety. Movement through an aviary system is not always hazard free. Systems are up to 3 m high, and birds may fall during their jumps or flights. Research shows us that up to 80% of aviary birds at the end of lay show keel bone damage, varying from severe fractures to bone deformations. Keel bone damage is obviously a major welfare issue, but also results in decreased production and therefore poses an economic problem as well. Several scientists have already revealed that, to reduce the risk of birds falling and crashing, the angles from one perch to the other should not exceed 45°, and distances for jumping/flying should be maximized at 1 m. On the other hand, for workers in an aviary system, a pass way between 2 system rows of less than 1 m is too narrow. Therefore, aviaries should allow birds to make vertical movements within the system, so there is no need to fly from one row to the other. Perches should be positioned in a way that allows birds to jump up and down the system, all the way to the top tier. Another challenge when working with aviary systems is red mite. Apart from a serious welfare issue, red mite results in increased feed intake by birds to compensate for the blood that the mites consume. Also, each time a crew is hired to eradicate the red mite population, this can cause stress to the flock. Over the past years, Vencomatic Group has been developing a special perch, the Q-Perch that electrocutes mites on their way to the laying hen as it perches at night. Our researchers discovered that mites come out of their hiding places during a specific timeframe in the night, to feed on the birds. The Q-perch obstructs the red mites route to the birds and prevents them from feeding. Most importantly, it obstructs the red mite from reproducing. This means the population of mites never increases and stays at an acceptable low level. There is no need for eradication programmes, reducing the stress in the flock. In addition, behavioural observations discovered that the birds rest better at night; there is less bird movement, as mites do not bother them. The Q-Perch was not only invented to solve the problem of the red mite. The shape of the perch is also designed to give the birds a better grip. The mushroom-shaped perch allows birds a better opportunity to land while moving throughout the system, and offers a more comfortable resting place at night.